Symbiotic interactions between organisms enable the exploitation of new ecological niches and can promote diversification. Prominent examples of symbiotic interactions include organelles (i.e. mitochondria and plastids) in eukaryotes and intracellular bacteria that persist in an obligate co-evolutionary relationship with specific insect host lineages. Our research combines molecular techniques, experimental approaches, and bioinformatic tools to investigate how co-evolutionary interactions between host and intracellular symbiont drives genomic and functional evolution of symbioses. Symbiotic relationships can become obligate where neither parter can persist without the other. These heritable obligate symbionts are often clonal and vertically transmitted and therefore experience high levels of genetic drift and accelerated rates of mutation accumulation. One main evolutionary consequence of endosymbiosis is reduction in genome size via gene loss and removal of excess non-coding DNA. Thus symbionts experience genome degradation that likely compromises fitness unless hosts are able to compensate for the functional deficits of symbionts. Many insects feeding on plant-sap rely on bacterial endosymbionts to synthesize and provision hosts with amino acids and vitamins that are lacking from their diet. The model system to study obligate symbiosis is between aphids and their obligate bacterial endosymbiont Buchnera aphidicola (Gammaproteobacteria). 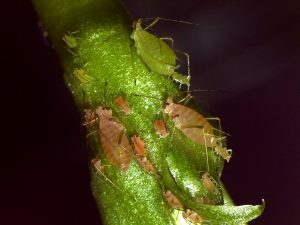 Our lab uses a combination of experimental, molecular, and bioinformatic approaches to study aphids (and other sap-feeding insects) and their microbial symbionts to understand the functional genomics and co-evolutionary dynamics of symbiosis. One of the most ancient examples of obligate symbionts are organelles including mitochondria and chloroplasts. In animals, mitochondrial genomes encode several genes involved in oxidative phosphorylation, the final steps of cellular respiration, while the remaining genes are encoded by the nuclear genome. This requires efficient coordination between the two genomes. Variation in energetic demand of animals likely exerts different levels of selection on genes related to metabolic function. For example, birds and mammals require high levels of energy and experience strong levels of purifying selection on mitochondrial genes, likely to maintain metabolic function. In contrast, salamanders have extremely low metabolic rates and experience relaxed selection on mitochondrial genes and increased variation in genome architecture. 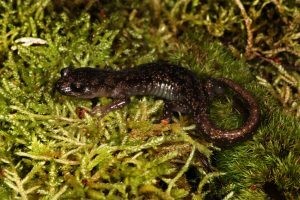 The high levels of genomic variation (mitochondrial and nuclear) found in salamanders provides a unique opportunity to investigate the drivers of genome evolution.